The Community Expo on Thursday will highlight the Academy’s innovative programs, including VEX Robotics. 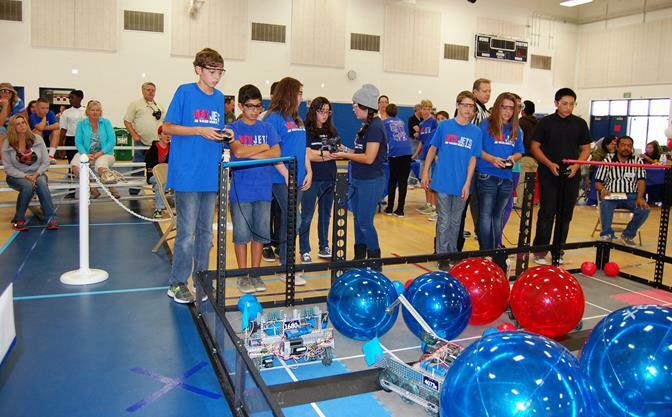 This past fall, Joe Walker Middle School hosted the first ever VEX robotics tournament in the Antelope Valley. LANCASTER – Joe Walker Middle School is hosting its annual STEALTH (Science Technology Engineering And Learning Through Humanities) Academy Community Expo this Thursday. This is the public’s opportunity to see the innovative programs they have to offer, including VEX Robotics, Lego Robotics, Civil Air Patrol, design, art and band. The Community Expo takes place from 5 to 7 p.m., Thursday, March 13, at Joe Walker Middle School, located at 5632 West Avenue L-8. The Expo will feature hands-on exhibits, lively demonstrations and an art show. A special parent workshop on college preparation and readiness will also be provided. The STEALTH academy is open to all 7th and 8th grade students in the Antelope Valley, not just those living in the Westside School District. Parents must apply for an opportunity to have their student join the program. Priority applications are being accepted through Friday, April 25. Local parents who would like to provide their children with opportunities to prepare for careers in science, engineering and related fields are invited to Thursday’s Community Expo to learn more. For more information about Joe Walker’s STEALTH Academy, visit the District Website at www.westside.k12.ca.us/jw or call the school at 661-943-3258.